Growth factor, cytokine and chemokine-induced activation of PI3K enzymes constitutes the start of a complex signalling cascade, which ultimately mediates cellular activities such as proliferation, differentiation, chemotaxis, survival, trafficking, and glucose homeostasis. The PI3K enzyme family is divided into 3 classes; class I (subdivided into IA and IB), class II (PI3K-C2α, PI3K-C2β and PI3K-C2γ) and class III PI3K. Expression of these enzymes in human tissue has not been clearly defined. In this study, we analysed the immunohistochemical topographical expression profile of class IA (anti-p85 adaptor) and class II PI3K (PI3K-C2α and PI3K-C2β) enzymes in 104 formalin-fixed, paraffin embedded normal adult human (age 33–71 years, median 44 years) tissue specimens including those from the gastrointestinal, genitourinary, hepatobiliary, endocrine, integument and lymphoid systems. Antibody specificity was verified by Western blotting of cell lysates and peptide blocking studies. Immunohistochemistry intensity was scored from undetectable to strong. PI3K enzymes were expressed in selected cell populations of epithelial or mesenchymal origin. Columnar epithelium and transitional epithelia were reactive but mucous secreting and stratified squamous epithelia were not. Mesenchymal elements (smooth muscle and endothelial cells) and glomerular epithelium were only expressed PI3K-C2α while ganglion cells expressed p85 and PI3K-C2β. All three enzymes were detected in macrophages, which served as an internal positive control. None of the three PI3K isozymes was detected in the stem cell/progenitor compartments or in B lymphocyte aggregates. Taken together, these data suggest that PI3K enzyme distribution is not ubiquitous but expressed selectively in fully differentiated, non-proliferating cells. Identification of the normal in vivo expression pattern of class IA and class II PI3K paves the way for further analyses which will clarify the role played by these enzymes in inflammatory, neoplastic and other human disease conditions. Phosphatidylinositol 3-kinases (PI3Ks) were first identified as enzymes associated with various oncoproteins and growth factor receptors . Evidence soon accumulated that PI3Ks can provide a critical signal for cell proliferation, cell survival, membrane trafficking, glucose transport, neurite outgrowth, membrane ruffling, and superoxide production as well as actin reorganization and chemotaxis [2, 3]. The diverse range of PI3K functional effects reflects its activation by multiple receptors, the existence of a PI3K enzyme family, and multiple effector proteins that can interact with PI3K lipid products by distinct structural motifs . Mammalian PI3Ks are divided into three classes based on their structure and substrate specificity . Class I enzymes are acutely activated by a variety of cell-surface receptors, and are responsible for synthesis of intracellular phosphatidylinositol (3,4,5)-trisphosphate (PtdIns (3,4,5) P3) . Class I PI3Ks are divided into two types. Class IA consists of a p110 catalytic subunit that associates with an SH2 domain-containing subunit: p85 (and its splice variants: p55 and p50). The p85 subunit is considered the most abundant of the class IA regulatory subunits. The majority of tyrosine kinase coupled transmembrane receptors can activate class IA PI3K, although there is a clear variation in the strength and duration of the resulting signals . The only class IB PI3K identified to date is the p110γ catalytic subunit complexed with a p101 regulatory protein and activated by heterotrimeric G proteins. Class IB PI3K is largely observed in white blood cells  with some expression in murine prostate, kidney, exocrine pancreas and salivary glands . PI3K-dependent accumulation of PtdIns (3,4,5) P3 initiated a multitude of downstream signals that include suppression of apoptosis, reorganization of the actin cytoskeleton, cardiac myocyte growth, glycogen synthase stimulation by insulin, TNF-mediated neutrophil priming and superoxide generation, and leukocyte migration and adhesion to endothelial cells [2, 8]. In contrast to class I PI3Ks, which are mainly cytosolic, class II PI3Ks are predominantly associated with membrane fractions of cells . Enzymes of this class are larger than class I or III PI3Ks, bind adaptor proteins via proline rich regions present within their N-terminal sequence . The association of class II PI3K enzymes with cellular membrane compartments might suggest participation of these enzymes in sorting events or vesicle formation . However, it has recently become evident that a variety of membrane receptors, including tyrosine kinases [insulin, epidermal growth factor receptor (EGFR), platelet derived growth factor receptor (PDGFR)] integrins and a chemokine, monocyte chemotactic peptide-1 (MCP-1), can activate the class II kinases [11–13]. Based on work with cell lines and Northern blotting, expression of PI3K-C2α, PI3K-C2β isoforms was considered ubiquitous [14, 15], whilst PI3K-C2γ was mainly found in the liver [16, 17]. Class III PI3K is homologous to the saccharomyces cervisiae Vps34p. It is a constitutively active enzyme whose product phosphatidylinositol-3-phosphate (PtdIns (3) P) plays an essential role in protein trafficking through the lysosome . Extensive insight into the PI3K signalling network has been gained through the use of PI3K inhibitors, overexpression approaches, gene targeting studies and microinjection of PI3K antibodies into cells [2, 4, 19]. Whilst these methodologies have assigned roles for PI3K enzyme activity, there is little evidence for critical non-redundant functions of individual enzyme subclasses. Fundamental to the understanding of PI3K enzyme specificity is therefore a robust definition and comparison of the pattern of PI3K expression in human tissues. The existence of multiple classes of PI3K enzymes and several isoforms within each class (class IA/IB, PI3K-C2α, PI3K-C2β, PI3K-C2γ) suggests significant signalling redundancy potentially manifesting in tissue/cell type specific expression. Identification of tissues in which individual or multiple PI3K isoforms are expressed could provide clues to the role or regulation of PI3K enzymes in vivo and identify more relevant in vitro systems to study these enzymes. Furthermore, recognition of PI3K tissue expression has clinical relevance as it would assist in developing targeted therapies utilising PI3K inhibitors. In this study, we analyze and describe the topographical and semi-quantitate the level of expression of three PI3K isoforms (IA PI3K (p85), PI3K-C2α and PI3K-C2β), which are considered to be widely distributed (data based on in vitro studies), in a range of normal human tissues using immunohistochemical techniques. The study was approved by the Hammersmith, Queen Charlotte's and Chelsea hospitals research ethics committee. A total of 104 adult normal human tissues specimens from the gastrointestinal (GI), respiratory, reproductive and genitourinary tracts were investigated for the expression of PI3K enzymes. Samples were obtained from the archives of the Department of Histopathology, Hammersmith Hospital, London. 4 μm thick serial sections were cut and mounted on Vectabond™-coated slides for immunohistochemistry. Expression of class I PI3K was investigated using an anti-PI3K monoclonal antibody (anti-p85) (BD Biosciences (Lexington, KY)) and for PI3K-C2α and PI3K-C2β, polyclonal rabbit antisera were generated as described previously [11, 14]. Briefly, N-terminal fragments of PI3K-C2α and PI3K-C2β were expressed as GST fusion proteins and used immunize rabbits at monthly intervals. One week after each injection, serum was obtained and its ability to immunoprecipitate and Western blot its corresponding protein was confirmed. For this study, each antibody was affinity purified using the respective fusion protein cross-linked onto glutathione-sepharose beads. To deplete anti-GST reactive antibodies, each eluate was incubated with an excess of GST immobilised on glutathione sepharose beads and the supernatant recovered. Anti-CD68 (PG-M1) (Dako, Denmark) was used in selected sections to identify macrophages in mononuclear cell populations. Before embarking on the study, dilution curves, microwave antigen retrieval schedules and enzymatic digestions, were determined for all antibodies used in this study (data not shown). Routinely formaldehyde-fixed, paraffin embedded tissues were deparaffinized, rehydrated in graded alcohols, and stained using the avidin-biotin immunoperoxidase method. Antigen retrieval was performed for 15 min in 10 mM citrate buffer (pH 6) on all sections either in a microwave oven (Whirlpool 750 watts) for anti-p85 antibody or in an autoclave (Prestige Medical, UK) for the class II PI3K antibodies. Sections were allowed to cool at room temperature and endogenous peroxidase was blocked by 0.03% H2O2. In the case of PI3K-C2 antibodies, serum blocking (normal goat serum (DAKO, Denmark)) and avidin-biotin blocking (Vector laboratories, USA) preceded the application of primary antibodies. The primary antibodies were diluted in PBS (Phosphate buffered saline (PBS pH 7.2+/-0.2 containing 0.1%BSA/0.1% sodium azide) p85 (1 μg/ml), PI3K-C2α (1:400) and PI3K-C2β (1:600) and incubated overnight at 4°C. To detect p85 expression, the DAKO Envision™ Kit was used according to the manufacturer's instructions while a secondary goat anti-rabbit antibody (DAKO) followed by avidin-biotin peroxidase (Vector Elite ABC kit, Vector Laboratories, Inc., Burlingame, CA) were used for detection of PI3K-C2. Reactivity was visualised using 3' diaminobenzidine (DAB), which produces a brown reaction product and then lightly counterstained in haematoxylin. Control slides, where the primary antibody was substituted with PBS or diluted non-immune mouse or rabbit IgG were checked for non-specific reactivity before assessment of the staining intensity and percentage of positive cells. PI3K antibodies were used for Western blotting on cell lysates prepared from breast (MCF-7, T47D) and prostate (CWR22Rv1, LNCaP, PC3 and DU145) cancer cell lines as previously described . Dilutions used were 0.1 μg /ml for p85 and 0.4 μg/ml for anti-class II PI3K antibodies. To confirm the specificity of the immunoreactive signal detected by IHC, serial dilutions of the PI3K-C2α peptide fragment (0.05–0.2 mg/ml) and the PI3K-C2β peptide fragment (0.08–0.5 mg/ml) were pre-incubated with their corresponding antibody for 2 hours at room temperature prior to immunostaining. To exclude reactivity with the GST fusion fragment of the antigenic peptide, antibodies were pre-incubated with GST prior to IHC. PI3K-C2α was pre-incubated with excess of PI3K-C2β peptide and vice versa to identify cross-reactivity between the PI3K-C2 antibodies. As an additional control, an irrelevant peptide (COX-2 peptide (Cayman Chemical, USA) 0.05–0.5 mg/ml) was pre-incubated with the class II antibodies prior to staining of sections. Intensity of PI3K immunoreactivity was quantified by two independent investigators (SES and PT) using a visual scoring scale (- undetectable; + weak; ++ moderate; +++ strong). The distribution of staining was considered membranous, cytoplasmic or nuclear, homogenous or heterogenous. In case of cytoplasmic expression, diffuse or granular appearance was recorded. Photomicrographs were captured using a DP12 Olympus camera (Olympus, UK) fitted on a Leitz Dialux 22 microscope (Leica microsystems, UK) at the indicated magnification. Each of the three antibodies recognised a single protein band of the appropriate size on Western blotting (Figure 1A). Neither of the class II PI3K antibodies have previously been assessed for their reactivity on fixed human tissues. To verify the specificity of PI3K-C2 immunoreactivity, blocking studies were performed by pre-incubation of each antibody with the protein fragment used to raise it prior to its application in IHC. This abolished class II PI3K antibody staining (Figure 1B,1C,1D,1E). Pre-incubation with equivalent concentrations of GST or an irrelevant peptide had no effect on immunostaining confirming specificity to each N-terminal PI3K-C2 sequence. Pre-incubation of PI3K-C2α antibody with N-terminal PI3K-C2β protein or PI3K-C2β antibody with N-terminal PI3K-C2α protein (at concentrations which completely blocked staining from its corresponding antibody) did not reduce the intensity of staining with antibody (data not shown). Negative control sections incubated with non-immune IgG or PBS were included with each experiment and were consistently negative. Specificity of immunohistochemical detection of the PI3K-C2 enzymes using antibodies raised against class II N-terminal peptide fragments. Lysates from breast (MCF-7 and T47D, lanes 1 and 2) and prostate (CWR22Rv1, LNCaP, PC3 and DU145 cells, lanes 3–6 respectively) cancer cell lines were probed for PI3K antibodies (p85, PI3K-C2α and PI3K-C2β). Molecular weight markers in KDa are indicated on the left. In the lower panels, representative PI3K-C2α and PI3K-C2β labelled sections with (B and D respectively) or without pre-absorption of each antibody with its antigenic peptide (0.1mg/ml of N-terminal PI3K-C2α in C and 0.5mg/ml of N-terminal PI3K-C2β in E) are presented. Original magnification (A-D × 200). PI3K expression patterns in normal human tissues. Abbreviations and symbols used: ND: Not determined; - undetectable; + weak; ++ moderate or +++ strong. Reactivity for PI3K-C2α in venous and capillary endothelium was not included in the tissue staining results. *Expression of PI3K-C2β was nuclear in spermatocytes. In the stomach, immunoreactivity for each PI3K antibody was limited to the basal third of the fundic glands where peptic (chief/zymogenic cells) predominate (Figure 2A). Expression was cytoplasmic coarse and granular. 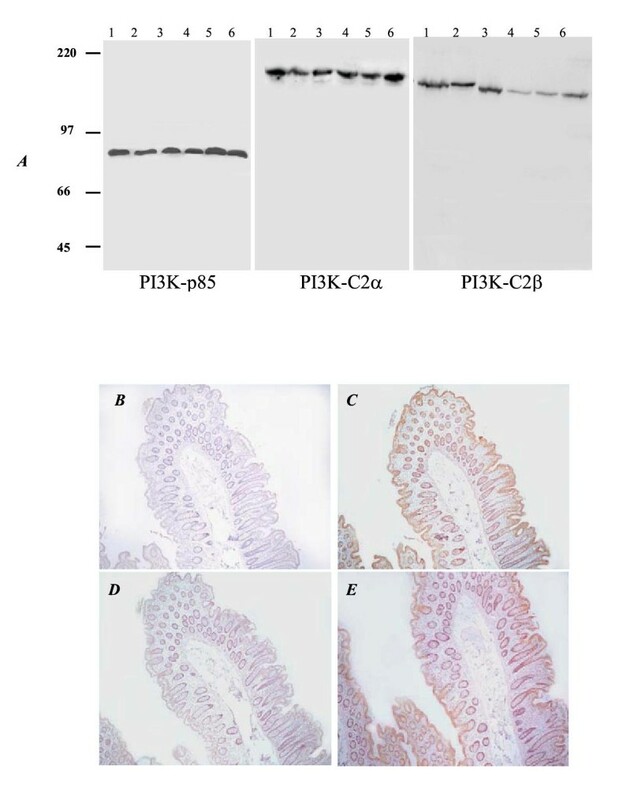 Along the crypt/villus axis of the small intestine, p85, PI3K-C2α and PI3K-C2β were expressed in enterocytes covering the intestinal villi while Paneth cells expressed only p85 (Figure 2B). Expression was cytoplasmic, coarse granular with p85 and diffuse for class II PI3K. In the colon and appendix, PI3K enzyme expression was observed in colonocytes. Mucous-secreting (gastric surface and neck mucous cells ; intestinal goblet cells and Brunner glands), neuroendocrine, and stromal cells of the lamina propria were negative. 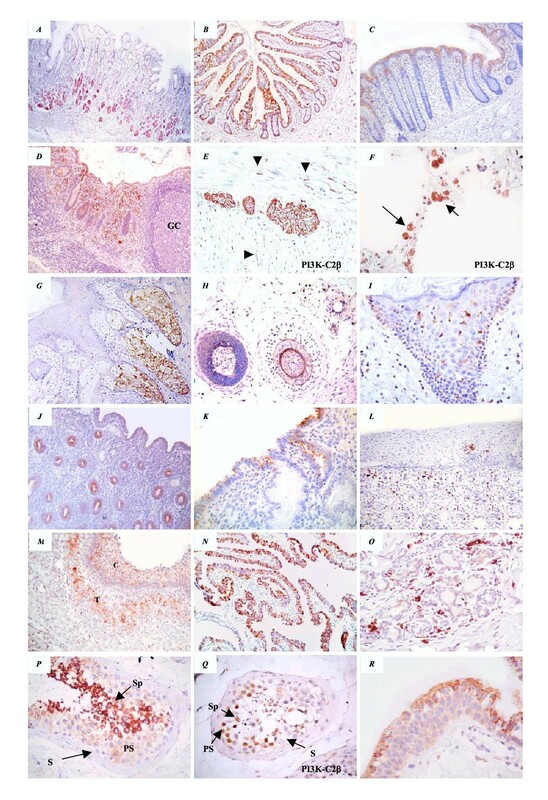 Representative sections of p85 and PI3K-C2β (E, F and Q) expression in adult human tissues. In the GI tract, expression was observed in the lower third of gastric glands (A), in villous enterocytes (B), in surface colonocytes (C) and in macrophages infiltrating the lamina propria, especially in the appendix (D). Note the lack of expression of p85 in reactive germinal centres (GC) or in mature B lymphocytes. Myenteric plexuses and unmyelinated nerves (arrow heads) penetrating smooth muscles expressed PI3K-C2β as shown (E). PI3K-C2β was strongly expressed in alveolar macrophages in the lung (marked by arrows) (F). In the skin, p85 reactivity was observed in sebaceous glands (G), in hair follicles (H) and in Langerhans cells (I). Luminal p85 immunoreactivity, which was observed in endometrial glands in the proliferative phase (J) gradually disappeared when the secretory phase developed to remain only on the surface (K). In the cervix (L), and breast (O) only infiltrating macrophages expressed p85, serving as an internal positive control. In the ovarian follicle, p85 expression was seen in granulosa and theca cells (M). Columnar ciliated fallopian tube epithelium was strongly reactive for p85 (N). In the testicular seminiferous tubules, p85 was expressed in the cytoplasm (P) while PI3K-C2β was expressed in the nuclei (Q) of primary spermatocyes (PS), spermatids (Sp) but not in sertoli cells (S). Transitional epithelium p85 expression was intensified in the uppermost (umbrella) layer (R). Original magnification (A, B, G, J, N × 100), (C, D, F, H, L, M × 200), (E, F, I, K, O-R × 400). Macrophages and other mononuclear cells found in the lamina propria expressed p85 PI3K-C2β and to a lesser extent PI3K-C2α. Lymphoid follicles were negative for all three enzymes with occasional positivity in germinal center macrophages (Figure 2D). Strong expression of p85 and PI3K-C2β but not PI3K-C2α was observed in the Ganglion cells in the parasympathetic ganglia of the submucosal (Meissner's) and myenteric (Auerbach's) plexus. PI3K-C2β was found in the unmyelinated nerve fibres penetrating between the smooth muscle fibres (Figure 2E) and myelinated peripheral nerves in the vicinity of major vessels. Neither the squamous (type I) nor the cuboidal (type II) pneumocytes expressed p85 or Class II PI3K enzymes. In contrast, all three PI3K enzymes were expressed in scattered alveolar macrophages (Figure 2F) and in the columnar epithelium lining the bronchioles. PI3K-C2α was expressed in an apical 'linear' pattern in ciliated cells. Bronchial mucous glands and cartilage did not express any of the 3 enzymes studied. Neither enzyme was expressed in keratinised squamous epithelium or melanocytes. In sebaceous glands, p85, PI3K-C2α and PI3K-C2β were expressed in acini but not in germinative cells (Figure 2G). Sweat glands expressed p85 in luminal secretory cells while PI3K-C2α was expressed in the myoepithelial layer and in sweat gland ducts. PI3K-C2β was undetectable in sweat glands (Figure 2H). At the level of the hair bulb, expression of p85 was barely detectable. At a higher level, p85 expression was noted in the companion layer (the innermost layer of the outer root sheath) and in the cuticle (the innermost layer of the internal root sheath). Hair matrix cells and follicular papillae did not express p85 (Figure 2H). PI3K-C2α and PI3K-C2β were not expressed in the hair follicle. Expression of p85 was observed in a subset of dermal mononuclear cell and Langerhans cells (Figure 2I) while PI3K-C2α and C2β were expressed in dermal macrophages only. The expression of p85 in endometrium varied with the menstrual cycle. In the proliferative phase, p85 was observed on the luminal surface of endometrial glands and heterogeneously on the luminal endometrial surface. In the secretory phase, p85 expression was attenuated from the glandular epithelium, now distended with secretion, to be retained only in the surface endometrium (Figure 2J,2K). There was no stromal expression of either enzyme throughout the cycle. PI3K-C2α and PI3K-C2β were not expressed in uterine glands. Myometrium and vascular smooth muscle expressed PI3K-C2α. Squamous epithelium of the cervix was negative for all 3 antibodies (Figure 2L). Ovarian tissue expressed p85 in granulosa cells of antral follicles and in theca cells (Figure 2M). PI3K-C2α and PI3K-C2β were expressed in theca cells only. Ovarian surface epithelium, rete ovarii and corpora lutei did not express PI3K. In the stroma, scattered positive macrophages were observed. Fallopian tube expressed p85 (Figure 2N), PI3K-C2α and PI3K-C2β in the cytoplasm of lining ciliated columnar epithelium. Whereas p85 and PI3K-C2β were expressed diffusely, PI3K-C2α was mainly expressed in a linear pattern beneath the cilia. 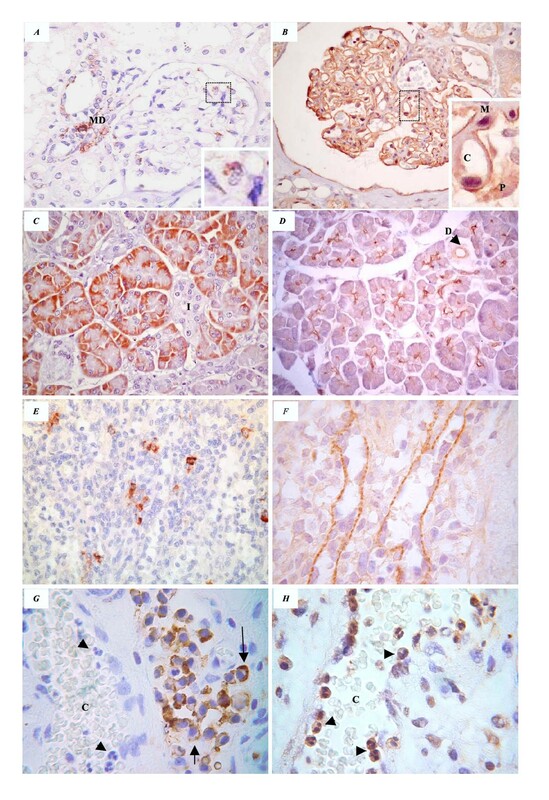 Normal breast lobules expressed no p85 (Figure 2O), PI3K-C2α or PI3K-C2β. In areas of apocrine metaplasia, weak expression of p85 was noted. Myoepithelial cells occasionally expressed PI3K-C2α, which was also weakly expressed in normal ductal epithelium. Germ cells in the basal and intermediate compartments of the seminiferous tubule, namely the spermatogonium, pre-leptotene, leptotene and zygotene spermatocytes, expressed weak p85 and PI3K-C2β. In the developmental stages extending from pachytene spermatocytes to elongating spermatids, reactivity for p85 (Figure 2P) was detected in the cytoplasm and for PI3K-C2β in the nuclei of germ cells. Strong p85 expression was found in secondary spermatocytes and this was maintained in mature spermatozoa. Spermatogonia lacked p85 and PI3K-C2β while final differentiating sperm were devoid of PI3K-C2β expression (Figure 2Q). No expression of PI3K-C2α was observed with spermatocytic maturation. In contrast to interstitial Leydig cells, in which weak heterogeneous expression of p85, PI3K-C2α and PI3K-C2β was observed, sertoli cells were not reactive for either antibody. Normal prostatic glands in the clinical setting of benign prostatic hyperplasia (BPH) did not express any p85 or PI3K-C2β. PI3K-C2α was expressed in an interrupted manner in basal (myoepithelial) prostatic cells and in prostatic fibromuscular stroma. In transitional epithelium, p85 and PI3K-C2β expression was generally strong in the cytoplasm of superficial cells and weak in the intermediate and basal cells (Figure 2R). Expression was heterogenous and scattered negative superficial cells were observed. Smooth muscle bundles and endothelium expressed PI3K-C2α. In the kidney, macrophages (confirmed by reactivity for CD68) were the only cells in the glomeruli, which expressed p85 and PI3K-C2β (Figure 3A). Expression of PI3K-C2α in the glomerular tuft was observed in the parietal layer of Bowman's capsule being reflected on and in continuity with reactivity in the visceral (podocyte) layer. It appeared to be distinct from glomerular endothelial lining as demonstrated in Figure 3B. In the renal tubules, cytoplasmic expression of p85 was seen in the macula densa and in collecting tubules (Figure 3A). PI3K-C2α and PI3K-C2β were weakly expressed in proximal, distal and collecting tubules and ducts. Heterogenous cytoplasmic expression for p85 and PI3K-C2α was noted in the exocrine component of the pancreas with no detectable immunoreactivity in islets of Langerhans' cells. The class I (p85) enzyme was expressed in the acinar cytoplasm in a subnuclear basal position (Figure 3C) while PI3K-C2α was expressed on the luminal border of the acinus corresponding to the intercalated ducts (Figure 3D). Pancreatic ducts (intralobular, interlobular and the larger ducts) only expressed PI3K-C2α. PI3K-C2β was not observed in the pancreas. Hepatocytes, hepatic sinusoids and Kupffer cells did not express detectable levels of p85, PI3K-C2α or PI3K-C2β. PI3K-C2α immunolabeled bile ducts. In the gall bladder, the lining epithelium was reactive for all three antibodies. No immunoreactivity for p85, PI3K-C2α and PI3K-C2β was detected in thyroid glands (follicular or parafollicular cells) or parathyroid glands (chief/principal) cells and oxyphil cells). In lymph nodes and in the spleen, p85 and PI3K-C2β reactivity was limited to a few cells in the interfollicular and medullary areas (Figure 3E). Endothelial cells lining venous sinusoids in the spleen expressed PI3K-C2α in a subnuclear position forming an interrupted linear, almost bead-like pattern (Figure 3F). p85, PI3K-C2α and PI3K-C2β labeled individual tissue macrophages (Figure 3G) and follicular dendritic cells in the germinal center but were not expressed in the B lymphocyte precursors or mature B cells (Figure 2D). Only PI3K-C2α was detected in significant levels in polymorphnuclear leucocytes (Figure 3G,3H). Most of the current literature relies on biochemical methods to provide evidence for the presence of PI3K mRNA or protein in human tissue or cell line lysates [14–16]. With a single report of p85 expression (in lung cancer)  and none relating to PI3K-C2α and PI3K-C2β, there was a need for a systematic study examining topographical expression and precise cellular localisation of PI3K enzymes in human tissues. Our report illustrates the selective expression of PI3K enzymes in normal adult human tissues, appearing to be restricted to the differentiated cell lineages compared to the proliferative and stem cell compartments. In differentiated cells (epithelial and mesenchymal), expression of p85, C2α and C2β, either singly or in combination, was observed only in a limited repertoire of cells. Differences in expression and in spatial localisation of PI3K isoforms possibly reflect the diverse roles played by these enzymes in various tissues in response to different ligands. In hepatocytes, endocrine organs (thyroid and parathyroid glands and Islets of Langerhans), squamous epithelium and secretory epithelia in general, no p85 or class II PI3K enzymes were detected. This either reflects very low levels of expression under normal in vivo conditions (not detectable by methods employed in this study), or the predominance of alternative PI3K isoforms in these tissues. In the liver, for example, there is biochemical evidence of high expression of PI3K-p50α and PI3K-C2γ in the liver [16, 17, 21]. Marked responsiveness of p50α to insulin suggests that this adaptor plays an important role in the activation of hepatic PI3K . Another observation was that those cells expressing only two PI3K isoforms, co-expression of p85 and PI3K-C2α was not observed (Figures 3 and 4). This, together with the unique expression of PI3K-C2α in mesenchymal elements (endothelial cells and smooth muscle cells), myoepithelial and ductal cells suggests a more specialized role for PI3K-C2α compared to p85 or PI3K-C2β. Further in vitro biochemical studies are required to elucidate this role. Overlapping patterns of PI3K enzyme expression in adult human tissues. Co-localisation of the p85, PI3K-α and PI3K-C2β was more frequently observed than expression of one or 2 of these enzymes. Expression of p85 and PI3K-C2α was not observed. PI3K expression was analysed in tissues representative of self regenerating stem cell systems such as skin, intestines, bladder, uterine cervix and testis (which normally show growth and differentiation throughout life), quiescent (stable) tissues such as parenchymal cells of the liver, kidney, pancreas, vascular endothelial cells and thyroid (tissues that show little growth in adult life but can be driven to proliferate by an appropriate stimulus), and of non-dividing (permanent) terminally differentiated cells that have no reserve capacity for growth such as neurones (ganglion cells) and macrophages . In self-regenerating tissues, shedding of epithelial cells is compensated by a precursor stem cell population that rapidly divides then selectively differentiates to replace lost cells . Proliferation and differentiation are inversely correlated processes where differentiation of primitive into more specialized cells involves increased restriction in proliferative capacity, culminating in cell-cycle exit and arrest . Well-defined stem cell compartments have been identified in the GI tract, skin and testis (reviewed in [25–27]). In these organs, p85, PI3K-C2α and PI3K-C2β were only expressed in fully differentiated cells. With the exception of the apical p85 expression in proliferative endometrium, there was no identifiable expression of PI3K enzymes in stem/progenitor or proliferating cell compartments. The absence of either p85 or class II PI3K immunoreactivity in germinal centres of reactive lymphoid follicles is consistent with our observation that PI3K enzymes are expressed in differentiated, committed cells and not in proliferating or immature cells. PI3K expression in permanent non-dividing, non-epithelial cells such as ganglion cells and macrophages is indicative of a general rather than cell-specific growth regulatory mechanism. Based on in vitro data examining cell cycle progression in cell lines and embryonic stem cells [28–32], we would have predicted an inverse pattern of expression to what was observed. Our data suggest an association between PI3K and cellular differentiation. This association is best demonstrated in intestinal epithelium and testicular seminiferous tubules, both of which are models to study the mechanisms of tissue differentiation. In these tissues, spatially organised stem cell, proliferative and differentiated compartments create a "gradient" of cell differentiation. In the intestine and the testis, PI3K expression increased with differentiation. The increase in PI3K expression in these tissues was more dramatic in the case of p85 than for class II enzymes. Previous in vitro data linking PI3K activation to differentiation have been controversial. In the intestine, our data supports the study by Laprise et al  who showed that PI3K activity promotes intestinal epithelial cell differentiation and contradicts others [34, 35] who propose that PI3K inhibition contributes to intestinal cell differentiation. The expression pattern of p85 observed in the testis is supported by data from Kissel et al  who showed that Kit-mediated PI3K signalling is critical for the development of male germ cells during the pre-meiotic stages. When these signals were interrupted, male sterility developed due to failure of germ cell to enter meiosis and increased apoptosis of primary spermatocytes . Interestingly, we observed nuclear PI3K-C2β immunoreactivity in developing spermatocytes. This pattern of expression was confined to the testis. A role for nuclear PI3K signalling has been recently identified . Conditions where the presence of nuclear PI3K-C2β was identified, were associated with compensatory rat liver regeneration and differentiation of HL-60 cell line along granulocytic lineage commitment pathways [38, 39]. 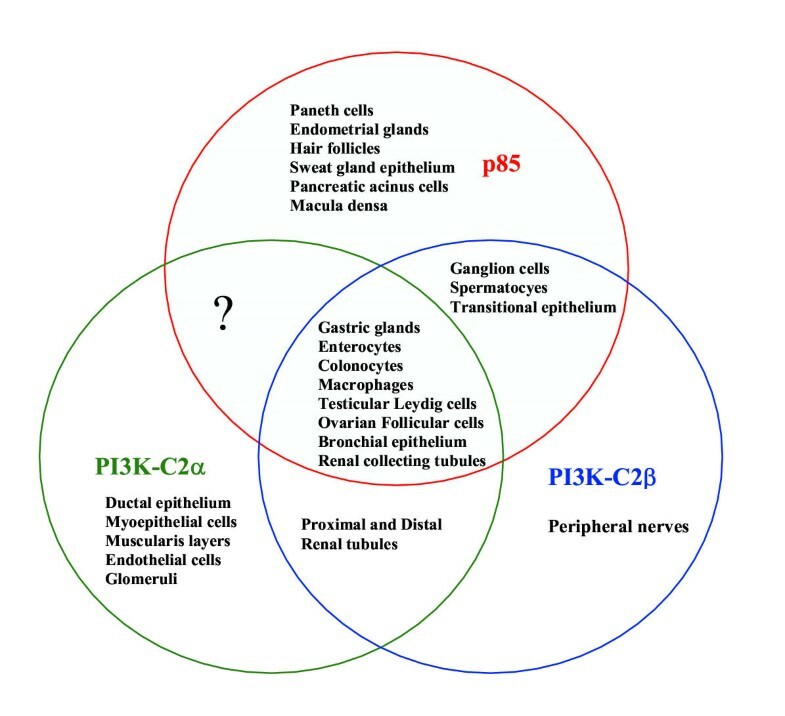 The significance of PI3K-C2β expression in the testis and its nuclear localisation is currently unknown. PI3K expression was observed in immune cells including macrophages and polymorphnuclear leucocytes. The intensity of expression in macrophages frequently exceeded that observed in epithelial cells. Interestingly, only a subset of CD68 positive macrophages (including Kuppfer cells) expressed PI3K enzymes. One possible explanation for this observation is that expression may be related to a specific phase in macrophage function. We are currently examining this possibility. Polymorphnuclear leucocytes expressed moderate-strong PI3K-C2α but not p85. This may be related to the relative abundance of the leukocyte-specific class IB PI3K isoform. In vitro observations show that PI3Ks are important regulators of phagocytosis . Class IA and III PI3Ks are thought to act consecutively in phagosome formation and maturation, and that their respective products, PtdIns (3,4,5) P3 and PtdIns (3) P accumulate transiently at different stages . The involvement of class II PI3Ks, which can also produce PtdIns (3) P can not be excluded . Although the exact mechanisms involved in receptor coupling remain obscure, MCP-1-induced activation of PI3K-C2α may contribute to some of its cellular responses. More vigorous investigations are needed to determine whether activation of PI3K-C2α or the related PI3KC2β occurs in response to other chemokines and to determine the functional significance of class II PI3K activation in macrophages. Unexpectedly, B-lymphocytes and their precursors were non reactive. A role for p85 in B lymphocyte development and activation was demonstrated in p85α deficient mice in two independent studies [42, 43]. However, the regulation of PI3K activation in p85 α-deficient mice is rather complex. In these knockouts, there is reduced expression of all class IA catalytic subunits with enhanced PI3K-dependent responses following stimulation [44–47]. Therefore, extrapolating from these knockout studies to human lymphocyte function is difficult. The results presented here in suggest a role of PI3K enzymes in differentiated cells, however, they do not rule out a role for these enzymes in proliferation. It is possible that proliferating cells express PI3K enzymes but at levels which were undetectable by methods used in this study. Other more sensitive methods such as real-time PCR could be employed in future studies to explore the above. One of the limitations of any IHC study is antibody specificity and antigen preservation. Identifying reliable PI3K antibodies for use in IHC has been especially challenging. Several commercially available and in-house class I PI3K antibodies (p85 or p110) including those used in previous IHC studies [20, 48] did not give satisfactory results in our hands. This was either due to limited sensitivity or reduced specificity (high background or multiple bands on the Western blot). We selected 3 PI3K antibodies (class IA PI3K (p85), PI3K-C2α and PI3K-C2β) that recognised a protein of the appropriate size on Western blotting and identified their target in formalin-fixed paraffin embedded tissues. Reactivity in IHC was specific as evidenced by successful blocking of immunoreactivity by the antigenic peptide fragments to which the antibodies were raised. We have demonstrated that, in contrast with their expression in cell lines of differing origins, class IA PI3K adaptor, p85, and class II PI3K enzymes display a specific and selective tissue distribution. PI3K enzyme expression in fully differentiated cells argues against their role in cell proliferation. Studies have indicated that p85 may act as a signalling protein independent of p110 [49, 50]. It is, therefore, conceivable that p85 signals detected in this report reflect p110-related lipid kinase activity and other p110-unrelated functions. The use of reliable p110 antibodies or novel anti-PtdIns (3,4,5) P3 antibodies  should allow more detailed and comprehensive mapping of the PI3K enzymes in normal and diseased human tissues, and provide insight into potential therapeutic targets of isoform specific PI3K antagonists. SSE: Performed experiments (Western blotting, PI3K-p85immunostaining), reviewed and interpreted the data, photomicrography and preparation of the manuscript. JD: together with ENL had the original idea for the project. Provision of affinity purified antibody to class II PI3K enzymes. Practical supervision of the project. Contributed to the design and relevance of the study, reviewed and interpreted the data. PA: contributed to the design and relevance of the study and reviewed and interpreted the data. PT: performed experiments with class II PI3K antibodies including peptide blocking. GS: reviewed and interpreted the data. ENL: was the primary supervisor of the project, had the original idea for the project, together with JD contributed to the design and relevance of the study, reviewed and interpreted the data and is the corresponding author. The conclusions were agreed by all authors. All authors contributed sections of text to the manuscript, read the manuscript and agreed to the final version.